I’m Adam from the Local Digital Collaboration Unit, and in this blog post I’ll update you on the application process for the Local Digital Fund. I’ll share what we’ve learnt in managing the first round of expressions of interest and share how we’re planning to manage the full applications once the call closes on 15 November. Firstly, as our previous posts mention, we had a fantastic response from the sector, receiving nearly 400 expressions of interest in the fund. Certain service areas proved especially popular - this analysis shows popularity by the themes we gave them during our first sift...and a whole lot more. We’ll talk more about how supporters around the country are building insights on our data in an upcoming blog. I mentioned above that we’d tagged each expression of interest by service area on our website. We’re glad we did this, as it definitely helped the sector to navigate bids online and find those they’d like to get involved with. We also hadn’t thought to ask applicants to title their proposed projects in a web-friendly way, so we ended up spending much more time than anticipated making up titles that succinctly explained each project. We likely didn’t nail this, and it’s something we hope to improve next time around. But again, we hope that by doing this work, we’ve made it that bit easier to find proposals of interest and to instigate collaboration. As a result, the full application form is smarter, asking applicants to self-title and self-tag. We’ve also asked applicants if they’re happy to be contacted directly through the website, so we don’t have to manually connect people looking to collaborate. Ultimately, we hope this means getting the data online faster and in a more useful format next time around. One thing we wanted to do that we won’t manage in time to publish the full applications, is to swap out our categories for some standard project types, like ‘data standards’, ‘design patterns’ or ‘capacity-building and skills’. We’re conscious that the categories we gave projects in our first sift was a mix of both service areas and project types. This is something we’ll have fixed for the next round of applications in the New Year. Confused about signing the Declaration? We’ve had some queries in the last few days about collaborating with councils that couldn’t get the Local Digital Declaration signed off in time. This blog explains how sign-up works and why, and this one shares some more reasons for signing. The Local Digital Fund is designed to help realise the collective ambition set out by many local organisations in the Local Digital Declaration. So, we believe it’s important to use the fund to incentivise the understanding and adoption of the Declaration. For this reason, signing up is a criterion for applying for money and all organisations named on a bid must have signed up - as per the prospectus. Bids that have more signed up organisations named have a better chance of succeeding, as it demonstrates to us a strong desire to make and use something reusable. Once projects get going, teams can still seek input from councils that weren’t able to sign-up in time. 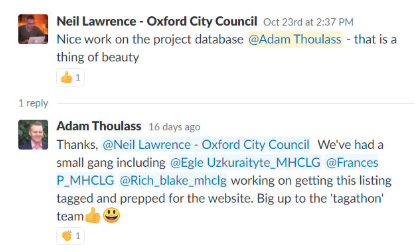 Ultimately our goal is to help councils collaborate more easily, so anything that helps to produce an open-standard, reusable tool is really welcome. Non-signed up councils just don’t get counted in our evaluation of bids. We had hoped to give more personalised feedback to councils that weren’t invited to proceed to the next round of funding. But we had to deprioritise this in favour of tagging up the data to make it as searchable as possible. By doing this tagging and publishing, we hope to help councils develop and realise their projects even if they don’t win money from this particular fund. Those keen to ask specific questions have been able to join periodic Q&A events on LocalGov Digital Slack - sign up here. 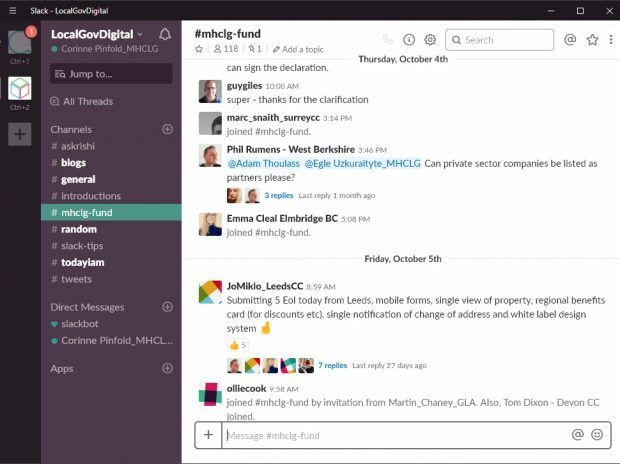 Our hope is that by dealing with queries via the Slack channel (#mhclg-fund), we’re able to maximise the reach of our feedback, with more people able to read it. Councils are also helping each other out in there. Some bids were really worthwhile, but they were about improving how councils use a particular proprietary product. Because the fund aims to ‘fix the plumbing’ and develop tools that can be used to help all suppliers in a particular service market, these proposals weren’t invited to proceed. 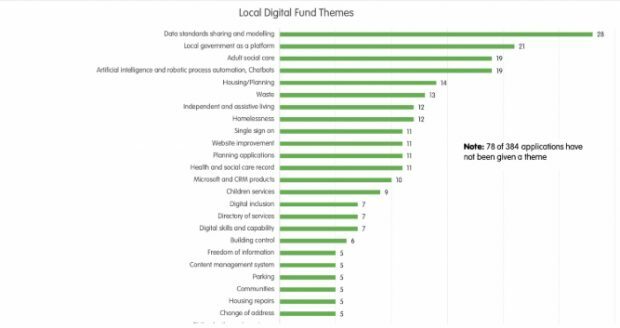 By analysing the fund data for that product, however, we hope that these councils find each other and collaborate with the vendors in question to solve the problems identified - hopefully in a way that can also benefit other providers in that market. It was unclear what problem some bids aimed to solve: a good chunk of applications went straight into describing a solution without spelling out the problem. There were some business as usual bids, where it looked like funding was being sought to help deliver a solution that had already been selected. Generally, these bids lacked an indication of how they would scale across multiple local authorities and therefore did not meet our criteria. Some of the alpha bids lacked the evidence of discovery to back them up. It felt like some of the alpha bids may have been better off applying for discovery funding to confirm the hypothesis/user need amongst a broader cohort of local authorities before then moving to an alpha application. Ultimately, even when some bids didn’t explain things as thoroughly as we’d have liked, we invited them to the next round because we thought that their full application could fulfil the criteria for funding outlined in the prospectus. For everyone else, we hope that you’ll get a lot out of reading through successful bids, you’ll join our community Slack chats, and you’ll refine your bid for the next round of funding in 2019. Applications close at 4pm on 15 November. The Local Digital Collaboration Unit team will do a first sift of these applications to ensure all criteria met. We’ll also give each application an initial score. We’ll then seek advice from policy officials in our ministry to refine our team’s scoring. Next, we’ll summarise our findings for ministers - in particular Local Government Minister Rishi Sunak, who has to sign off on how we spend the fund. Taking all of this information on board, we’ll play back our findings to an independent panel of experts on 27 November. They’ll make the last recommendations, which we’ll take back to the Minister for a final decision on which projects to fund first. We’ll tell councils that they have been successful by 3 December - though we might not make decisions public until the end of that week to allow for queries and concerns raised. And we’ll host a kick-off workshop for successful councils to think through delivery plans together with our support on 13 December in London. So, if you’re bidding, please hold this date in your diary. We’ve also begun new user research on the application process to date. This should help us identify ways in which we can make collaboration on common applications easier in the future. We also hope it will help us anticipate the collaboration support needs of the projects we fund. We’ll blog about the early findings of this work soon. In the meantime, best of luck to all applicants, we look forward to reading your work soon. And remember, even if you don’t win funding in this round, we’ll do our best to ensure your application work is not in vain. Between future rounds of funding and our work to expose promising projects on our website, we hope that many more projects are realised than just those funded by MHCLG.